John La Farge : Surf Riding at Papara, Tahiti, 1891. Garden City, New York, 1901, page 318. This description of surf riding and the associated artwork were noted by Herve Manificat, The Surf Blurb, 24th February 2013. "LaFarge's earliest drawings and landscapes, from his studies in Newport, show marked originality, especially in the handling of color values. He was a pioneer in the study of Japanese art, the influence of which is seen in his work and presented a lecture, "Hokusai: a talk about Japanese painting," in New York in 1897. 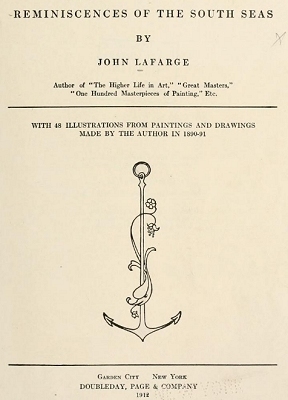 During his life, LaFarge maintained a studio at 51 West 10th Street in Greenwich Village, which now is part of the site of Eugene Lang College at the New School University. He made extensive travels in Asia and the South Pacific, which inspired his painting. He visited Japan in 1886, and the South Seas in 1890 and 1891, in particular spending time and absorbing the culture of Tahiti. Henry Adams accompanied him on these trips as a travel companion. He visited Hawaii in September of 1890, where he painted scenic spots on Oahu and traveled to the Island of Hawaii to paint an active volcano." Adams, Henry: Letters of Henry AdamsVolume 1. 1930. Did he go with La Farge on Papara beach on April 7th morning?" Adams' comment on page 476, "neither dance nor game have I seen or heard of, nor surf-swimming," is often cited as evidence of the demise of surfriding inTahiti by the end of the 19th century. Cleary, Adams' comment is misleading. Adams and La Farge journeyed from Papeete to Papara, on the southern coast, on or about the 26th February, where they stayed for several days. "The house stands flat on the seashore, and as I shook hands with Tati, and his old mother and his sister, I caught glimpses of an intense blue sea, through the open doors and windows behind; a sea that came close up to the grass, and had three lines of surf rolling in, through an opening in the reef, and rolling close up till they sent small waves into the entrance of the little river that flows close by the house." -pages 470-471. While staying with Tati, Adams was most impressed with "Old Mrs. Salmon" a elderly native woman who "when she is inclined to talk, she tells us about pagan Tahiti; old songs, superstitions and customs." "the women ... no longer dance or swim on the reef. Long ago, each district had its professional beauties who were carried about on malangas and matched with the professional beauties of other districts. The great swells made songs for themselves, to be sung when they went out to show their figures by riding their planks on the surf. No more beauties exist." -page 471. At the end of the month, Adams and La Farge travelled to Tautira, the residence of Robert Louis Stevenson located on the south-east coast. Here, Adams, possibly contemplating the stories of Mrs. Salmon, wrote that he had neither "seen or heard of ... surf-swimming." Dated 23rd March, it is conceivable that at this point neither he or La Farge had not observed surf riding. This is perhaps not unexpected, given the ephemeral nature of suitable surf riding conditions. The party returned to Papara in early April, Adams described the ceremonial opening of a newly constructed bridge on the 3rd, where "beyond, hardly a stone's-throw away, the surf rolling in miles of foam straight up to our hands." -page 478. La Farge's report of surf riding at Papara is dated 7th April, and describes girls swimming in the mouth of a stream, presumably "the little river" near Tati's house, while "the boys and one of the men ... were carried along the shore leaning on their boards." The comment, "the currents of the sea carried them past us looking on" seems to imply the surf riders were riding from the ocean into the mouth of the stream; on first arriving at Papara, Adams had noted the "small waves (rolling) into the entrance of the little river." That these small waves were now large enough for surf riding, suggests that the outside swell on this day was significant. Although Adams had also returned to Papara (he wrote letters from Papara dated 4th and 8th April), it appears he may not have been at the beach to witness the surf riding. However, it seems highly unlikely that it was not at least mentioned later in conversation by the travelling companions. In preparing his letters for publication, Adams did not revise his earlier (premature) entry. 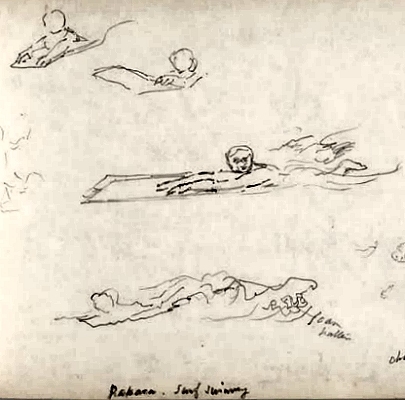 Importantly, Herve Magnificat also noted: "John La Farge also drew some sketches of Papara’s surfing children" and provided a link to Yale Art Gallery Online. La Frage and Adams in Tahiti, February 4 - June 5, 1891. Hodermarsky: John La Farge's Second Paradise, Yale University Press, New Haven, 2010. La Farge and Adams left Apia, Samoa, on 29 January aboard the steamer Richmond. Arriving at Papeete on 4 February and unable to find hotel, they rent a small cottage. Adams observes that the "imbecile" French administration suppresses many of the native customs, and appears to have superimposed much of French culture onto the Tahitians. After three weeks in Papeete, where they become familiar with many local identities, they travelled by wagon on 24 February to pay their respects to Arii Taimai (known familiarly as Hinarii). Now in her sixties and the only person of stature on the island who continues the old traditions, La Farge and Adams are fascinated by her stories and histories and take photographs of her. Later, Adams will painstakingly record her memories in his notebooks, which he will publish in Paris in 1901. While some of the traditional culture has survived, the village himene has been "appropriated as hymn-music for church-purposes." Here, La Farge completed two watercolours, depicting Papara from in front of Tati Salmon's house (Fig. 24 and 26). On 27 February La Farge and Adams left Papara for Tautira, on the eastern peninsula of Taiarapu, arriving that evening. Whereas Adams finds little to write about here, La Farge finds plenty of subject matter for his watercolors, including several studies of the reef at Tautira (Fig. 82 and 83). They returned to Papara on the 3 April, and during the week, both La Farge and Adams are adopted into the Teva family and invested with land. This is a rarely bestowed honor, as before them, only the Prince of Sweden received a Teva name. On the 7 April, La Farge observes the locals surf riding and made several sketches in his notebook. 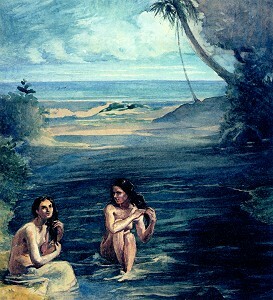 A watercolour, Women bathing in the Papara River, 1891 (Fig. 89), which appears to show some wave action at the river entrance, may have been painted at this time. 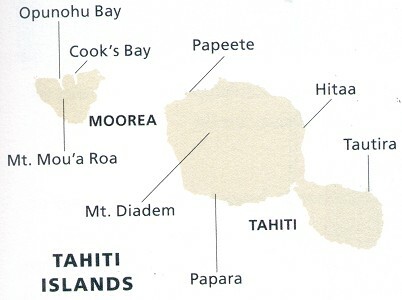 Two days later they returned to Papeete and on 12 April, departed for Moorea, the westernmost island of Tahiti. Their stay is interrupted with news of possible passage by steamer to Fiji by way of Auckland, and they returned to Papeete on the 24. Unable to secure a stateroom, they are forced to remain in Tahiti for another six weeks, residing at the United States Consulate. During this time, Adams begins to record the biographies and Tahitian histories as related to them by Arii Taimai and her daughter, Queen Marau, and on May 16, they journey to Faa (west of Papeete) for a traditional Tahitian feast at the home of Queen Marau. On June 3 they departed for Hitiaa, on the eastern coast of Tahiti, and en route stop at Papara to enjoy a last breakfast with the Teva-Salmons. Two days later La Farge and Adams embarked for Fiji aboard the Richmond. This is a land where to live would have made you happy. Outdoors and in the water, and in no compulsory dress, would have been your usual way of passing a great part of the time. I thought of you while I looked this morning at the children playing in the water of the little river, or in the surf that rolls into it or along the shore. The girls, little wee things, swam in the stream near its mouth, where it is safe, and plunged in and out, and swam under water, their feet and backs showing within the light and dark of the currents; for the river has been very full, and the surf and tide have been heavy, so that the children take their turn with the current. The boys were out in the surf, on the border of which occasionally the girls played, edging sideways to it, and running back with swinging arms. The boys and one of the men plunged out with surf boards, ducking under or riding over the waves that did not suit them; then turning just before the wave that suited, they were carried along the shore leaning on their boards. The currents of the sea carried them past us looking on. rough as the surf was, one of them had got past one of the lines of the breakers and tried fishing in some bottom both higher and less vexed. It was a pretty sight, the brown limbs and bodies all red in the sun and wet, coming out of the blue and white water like red flowers. The girls were yellower more golden than the boys- less tanned I suppose. 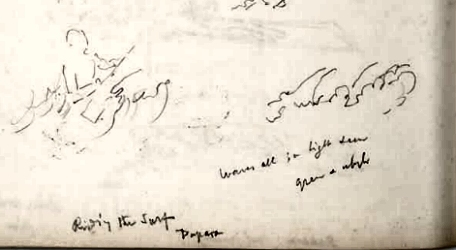 These sketches by John La Farge were identified by Herve Magnificat, along with La Frage's account detailed above, in The Surf Blub, 24th February 2013. Herve Magnificat noted: "John La Farge also drew some sketches of Papara’s surfing children" and provided a link to Yale Art Gallery Online. Unfortunately, these are not included in Hodermarsky: John La Farge's Second Paradise (2010). While the sketches appear to be upside down in the sketchbook, they are rotated in the enlarged views. Unfortunately, it appears La Farge did not incorporate any of the surf riding sketches into the many paintings he made of Tahiti. The images below are cropped and darkened to enhance the detail. Two Studies Of Surf Breaking On Outside Reef Tautira Taiarapu Tahiti-March1891." Women bathing in Papara River, 1891. 25 1/2 x 23 1/2 in. Collection of Jean and Alvin Snowiss. Note that this watercolour appears to show some wave action at the river entrance. Garden City, New York, 1901. 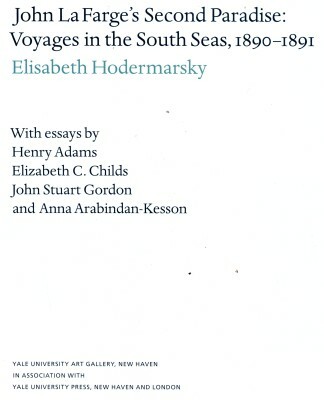 Voyages in the South Seas, 1890-1891. Yale University Press, New Haven, 2010. Geoff Cater (2013) : John La Frage : Surfing at Papara, Tahiti, 1891.